Dr Sindy Joyce has become the first Traveller in Ireland to graduate with a PhD. 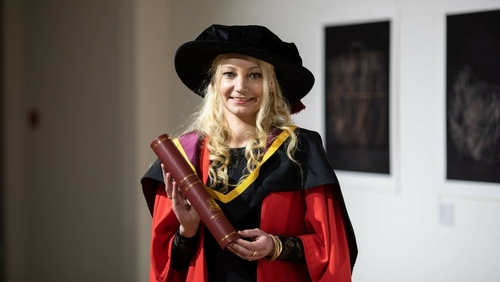 Dr Joyce was conferred at the University of Limerick following the completion of her doctoral thesis, which examines how young Travellers' experiences in urban space are shaped by their ethnicity and anti-Traveller racism. The Limerick native, who has won several awards over the course of her studies, said that she was "really proud to be the first in the Mincéir (Traveller) community to receive a doctorate", but that it is "sad that it’s taken until 2019 for it to happen". Dr Joyce said that she was "not fond" of being referred to as a role model, but added that it was important for young children to see people from their community "being able to push the barriers forward and break that glass ceiling – especially as a woman". She said that "things are often ten times harder for us", adding that Travellers face harsh judgement in the public. "So we know that when we go out into the world and do something like this, we are representing the whole community - whether we like it or not," she said. Dr Joyce's research "gives important visibility to the Traveller perspective", said Co-Director of Pavee Point Martin Collins. He added: "Travellers, down through the years, have often been researched and documented, but usually by people outside our community. "It is an important step for Travellers that we have our own academics who can decide what is important from a research point of view, and what is ethical in carrying out this research. "Sindy Joyce, on a personal level, is a great role model and an inspiration. Her hard work and determination in her studies shows that all Travellers are missing are the opportunities to succeed." Dr Joyce is one of 67 students who are being conferred with PhD awards this week at UL. On Monday, Bob Geldof and Marian Keyes were presented with honorary doctorates by the university, while later this week, local band The Cranberries will receive an award a year on from the sudden death of lead singer Dolores O’Riordan.